I originally started this blog back in 2011 as sort of a journal to track our progress as I attempted to toilet train my kittens. If you want to follow our toilet training posts from start to finish, click here to read them. A little backstory: We trained with the Litter Kwitter from October 2011-May 2012. 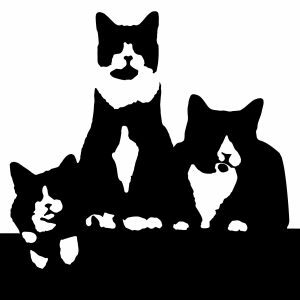 We used the standard 3 trays and also ordered their Multi-Cat Kit , which provides you with two additional trays to make the transitioning between steps a little easier. I discovered early on that this was key for us. One of our boys (Ben) picked up on it quicker than the other. Things were ok for a while; we didn’t have too many accidents. Eventually, the one who was having difficulties (Desmond) decided to start going on our living room rug to make a statement. I finally broke down after 8 months of training and bought them a litter box. They began using it happily and I pretty much gave up all hope that they would ever use the toilet again. Then 6 months later, in December of 2012, Ben (the one who never seemed to have any difficulties with the training) began using the toilet all on his own. We had taken the Litter Kwitter off the toilet months before that, and to this day we have no idea what prompted him to begin using the toilet again, but we aren’t complaining! He’s now 7 years old and still uses the toilet on his own while the other cats use the box.